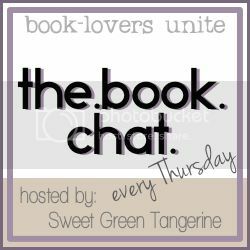 So, this week we are talking about COOKBOOKS! They're books, right? Our co-host this week is the lovely miss Angie of Angie Eats Peace. She's a super-sweet tree hugger, and I like her. Go show some love. I had the idea for this week's topic to do more than just list my favorites. Honestly, I don't have many "favorites". So, rather, I thought it would be fun to pick a new cookbook and try a recipe, then share it here. When browsing the cookbook section of the library, this one jumped out immediately. HOW COULD I NOT? I mean, it's the book chat. So, honestly, when I saw this book on the shelves a few months back, I laughed. Because it's freakin funny, people. Let me get that out of the way first. The inside is hilarious. The writer (Fowler, get it?) goes all the way with this parody (goes all the way...get it? (okay I'll stop)) . No, really though. It's creative and had me cracking up. Before each recipe is a little narrative from the chicken. I was dying. There were provocative pictures of the half-naked chef tying up the chicken...and stuffing the chicken. Okay, I'm done. Take it from me, it was clever and I appreciated it. So, I made this recipe instead. Basically, a whole chicken rubbed down with paprika, stuffed with oranges (or tangerines!) and covered in bacon. It was easy and delicious! The boys gobbled it up (get it...sorry). I would easily recommend this as a legit cookbook. Oh and for the record...this is the view from my kitchen window. It was hard not to feel a little guilty. Next week, in light of BEA taking place this week (have fun if you're going, I hate you) let's talk about BOOK BLOGGING. Anything and everything on the topic. Do you consider yourself a book blogger? Do you write reviews, receive ARCs or have you met any good authors? Has blogging changed how and what you read? WHO are your favorite book bloggers? That chicken sounds really good! 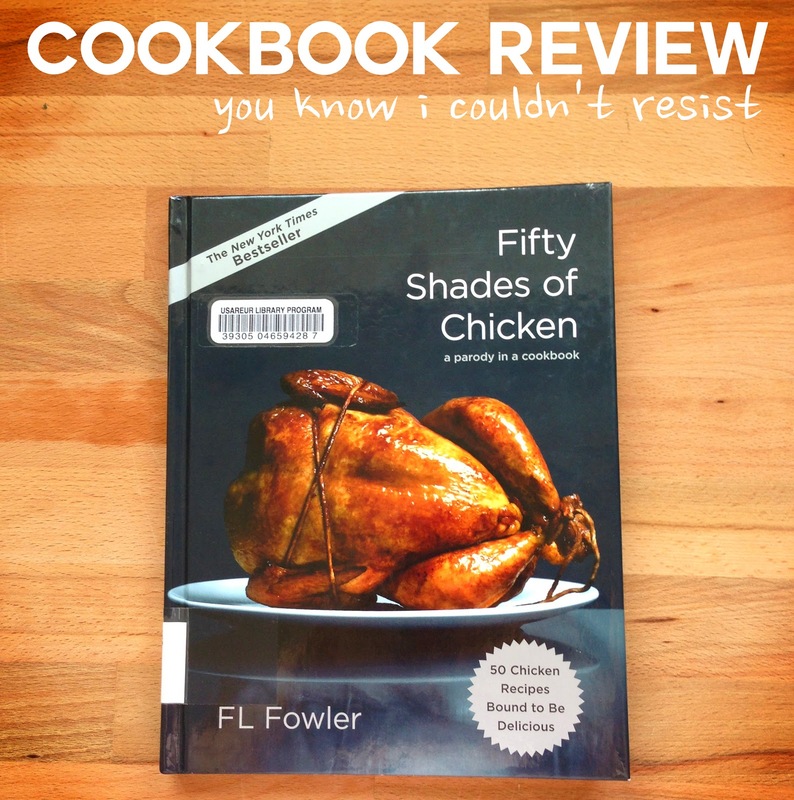 I need to get my hands on this cookbook. I love your book stand! That's freakin hilarious! I might have to stop by the library on base here just to see if they have it. 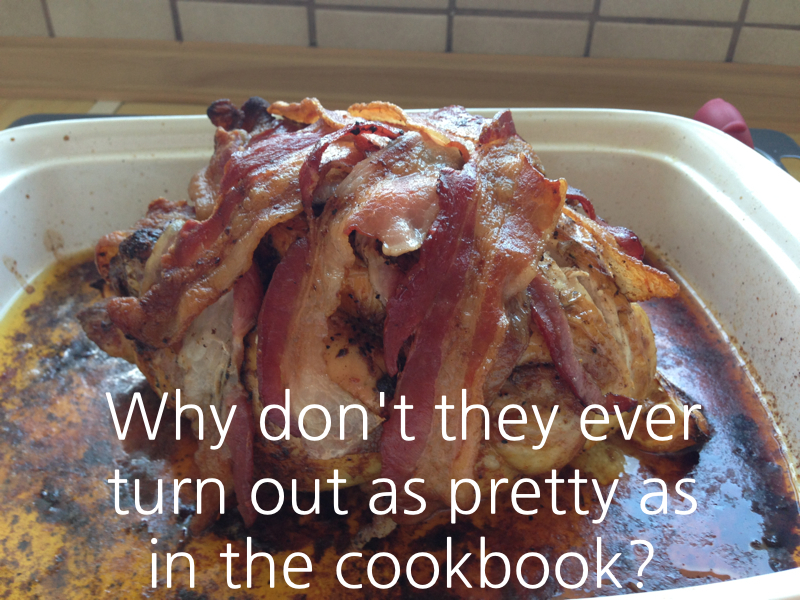 I don't eat much meat but I bet it sounds like a good read even if you don't cook from it! As soon as I saw the book title, I laughed. 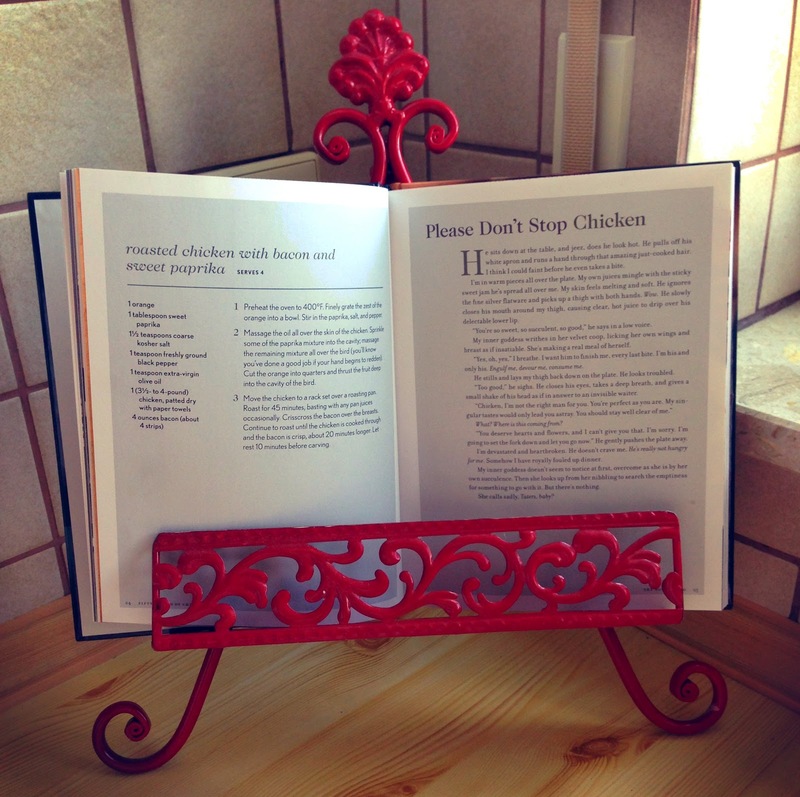 I love your cookbook holder! Very cute. Thanks for the opportunity to co-host, this topic was a lot of fun! I love that title! I tried to cook by making what I was cooking look like the picture and I failed spectacularly. I wonder if my library has that book? That cookbook makes me laugh ALL the time at work. Also L M A O @ the neighbors' chickens comment! I'm excited for next week's chat! I wish I was at BEA. I'm so depressed about not being there. I think if I hadn't booked a vacation this summer, that's EXACTLY where I would be right now!